When thinking of differentiation in the classroom, it is easy to fall into the trap of putting pressure on ourselves to perfectly level activities for every student. My mind goes to having a rotated set of groups and centers all perfectly ready to go. In this scenario you never run out of time, every student is exactly where they need to be, AND they are accountable, focused and staying on task the entire time. Don’t get me wrong, math workshops are a beautiful thing, but it doesn’t always work as smoothly as we’d like. It is okay to differentiate in small ways, taking small steps to be sure that we are meeting the needs of all children without going crazy ourselves. This past summer I was lucky enough to read work by Timothy Kanold, and then I was able to work with him in a workshop as well. He proposes that instead of coming up with different activities for every student, we have the same task, but with different entry points. So what does this look like exactly? 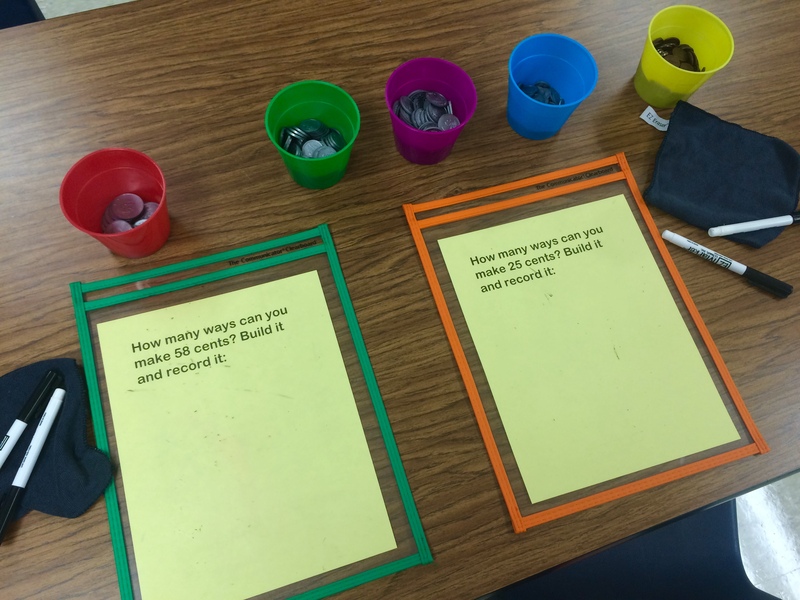 Task: How many ways can you build 58 cents? Build it and record it. All of the students in this group are given the same task, but usually all of the students have different levels of knowledge surrounding this task. So instead of coming up with 25 different activities you have only one. As the activity begins and students begin to work, two things will happen which we all can predict every time. Some students will struggle, and others will fly. This is when you strategically give certain students more. For the students who struggle in this case you would lay down another task next to it, where the number is more accessible, and you may also consider telling them the value of all of the coins. Instead of 58 cents, the students who struggle are working with a more accessible number, side by side with the other students. In this case for the students that are excelling there are many options: ask them to find the solution if you eliminate one of the types of coins, ask them to show their thinking algebraically using a table, give a different amount and have them predict the number of solutions they may find before solving, or ask them to write a story in which you may need to come up with 58 cents worth of change. The main thing is that you have to truly be walking your room, listening to your students and conferring with them as they solve. The BEST part of this method, is students are working together and hearing one another’s thinking, elevating the learning for all in the room. That first day of school is so full of jitters, for both the teacher and the students. Every time August hits and the weather changes I get that overwhelming feeling of uncertainty. What is the new school year going to bring? Am I ready? What are the students going to be like? It doesn’t seem to matter how many years I’ve been teaching, or how many classrooms I’ll be working in (25 this year! ), I still have the feeling and it borders on both anxiety and excitement. To ease this stress for both myself and the kids, I’ve always started the year with People BINGO. This is a silly little game in which students get to move around and get out those first day jitters by meeting each other and learning more about their classmates. So I thought, of course, why not put a math twist on this? A great game to get kids talking, moving and doing a little math right on the first day of school. I have four different BINGO boards, where the prompts are the same but the math is more accessible, one each for Grades 2-5. 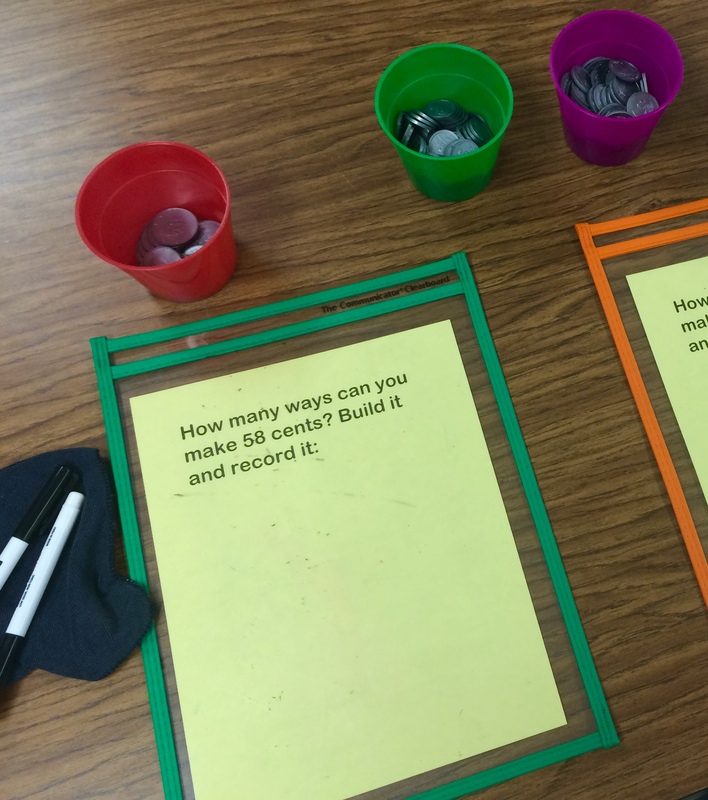 The activities are aligned to typical end of the year standards (Grade 5 has things that fourth graders would have learned a little about the year before). There may be a few fun ones in there to challenge the students, too. Check it out and see if you like it! Back to school activities that get kids up and moving help decrease those first day jitters!